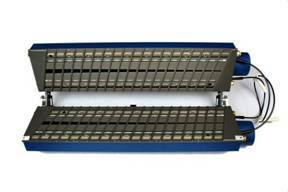 SPECIFICALLY DEVELOPED FOR DIGITAL PRINTING OPERATIONS. Harleysville, PA. – ElectroStatics, Inc, a market leader in static control and web/sheet cleaning systems for over 30 years, has announced the development of a new line of non contact narrow web cleaning systems specifically optimized for the challenges in commercial digital printing operations. The new line of narrow web cleaners are called the “AutoStat-D”. 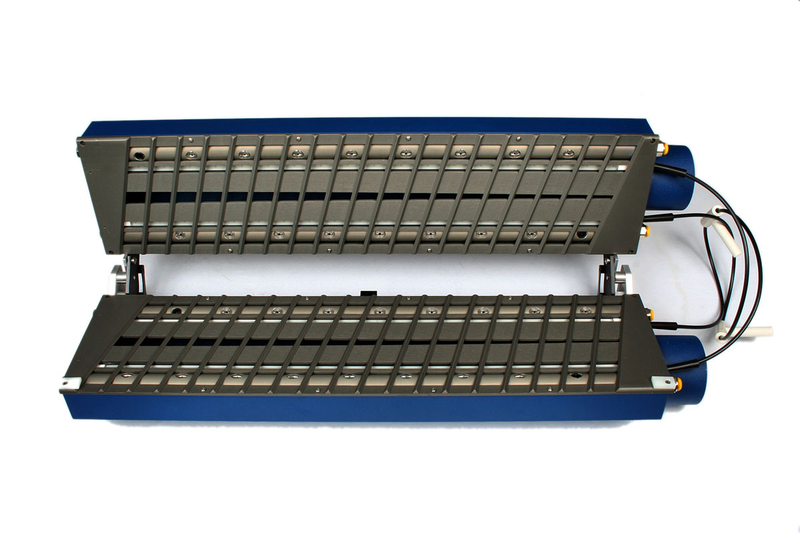 The AutoStat –D web cleaners are designed to fit continuous feed digital printing equipment from manufactures including but not limited to: Eastman Kodak, Hewlett-Packard, Xerox, Canon, Océ NV, IBM, Nipson, BÖWE BELL + HOWELL. Electrostatics, Inc. is using its patented grooved faceplate design which allows the AutoStat-D cleaners to be placed extremely close to thin or low-tension webs without risking drawing the web into the vacuum slot. The AutoStat-D system integrates the faceplate with its static control equipment, air jets, and torsion bar hinges into a slightly wider vacuum hood design. The wider hood and faceplate allow increased cleaning time for the system to be that much more effective. The AutoStat-D cleaning hood assembly is coupled with a newly developed, high efficiency dust collection/air filtration system. 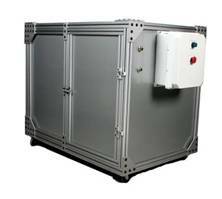 The dust collection cabinet contains optional compressed air system which allows operators with out their own compressed air to take full advantage of the AutoStat-D web cleaning technology. Robert Myers added “Our diverse experience in cleaning different materials such as: circuit boards, business forms, plastic film, flexible circuit boards, nonwovens and tissue paper helps us tackle new applications. Our web cleaners have been used in the printing industry for decades. Our experience allowed us to address the challenges of low web tension and limited/if any compressed air service facing printers using inkjet and toner based digital printing. Click on photo for High resolution copy. The patented grooved face plate used in the Auto-Stat – D is clearly seen as shown in the open clam shell configuration. This photo also demonstrates the innovative torsion bar counter weight which can hold the top hood open at any position. The enclosed dust collection system has a 0.5 micron filter, air compressor, and power supply for the static bars in the hood assembly. The dust collector system is very quit, requires little maintenance and is on casters to make it easy to move. 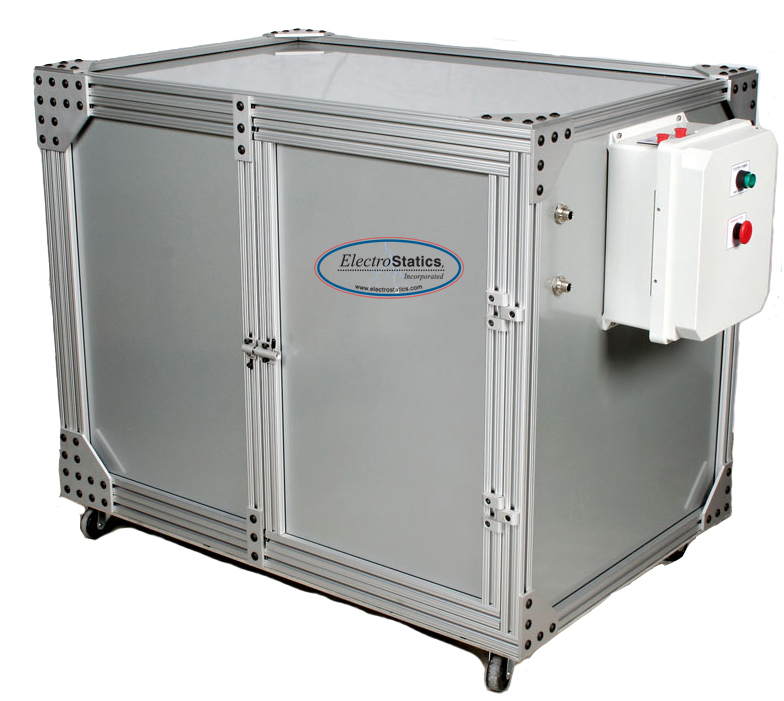 ElectroStatics Incorporated is a leading manufacturer and marketer of systems to control static electricity and remove contamination related to static electricity. The product line includes but is not limited to Static Meters, Static Bars, Static Generating equipment, ionization blowers, static control blow off guns, Static Eliminators, Grounding, Web Cleaners and Contamination / Dust Control devices. For the complete static control and web cleaning product line from ElectroStatics, Inc. visit electrostatics.com.